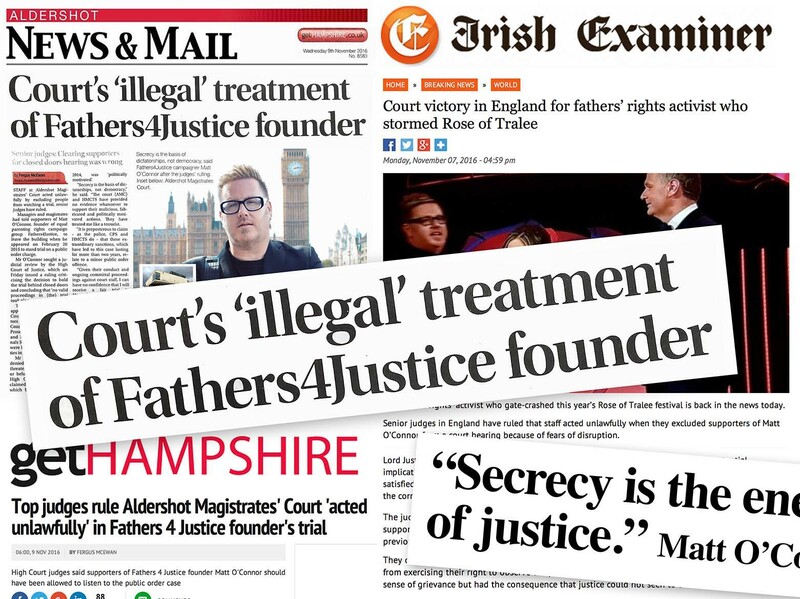 Find out how one man’s experience in the secret family courts led to the creation of Fathers4Justice, one of the world’s leading campaign groups. 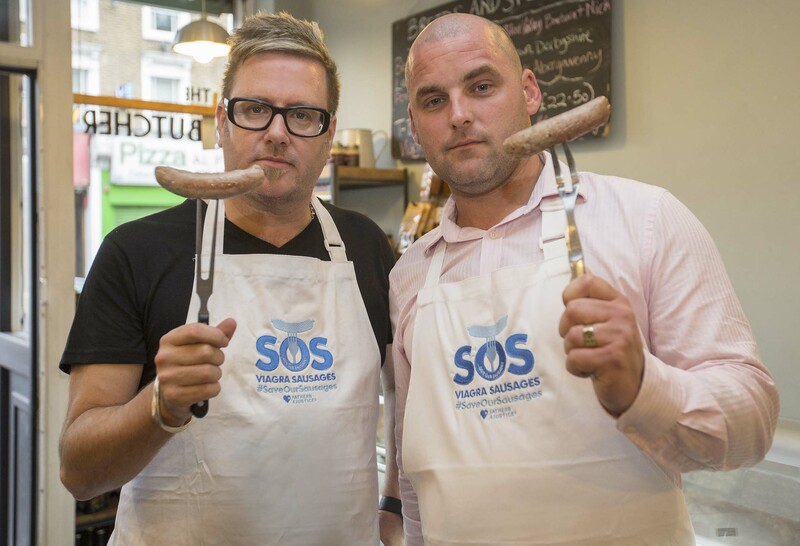 Fathers4Justice was founded by Matt O’Connor in 2001 after he was denied access to his two boys, Daniel and Alexander, following a difficult divorce. 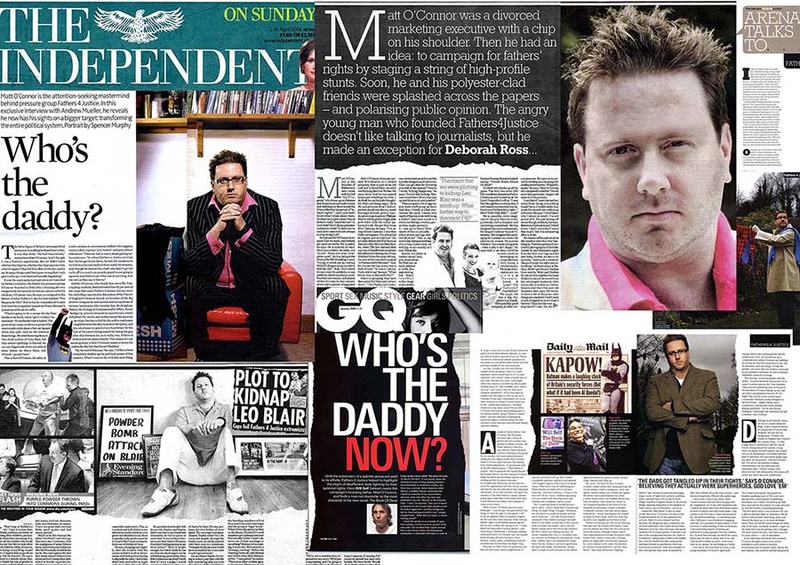 A design, marketing and PR consultant, Matt was shocked by the cruel, degrading and inhuman treatment of dads in Britain’s secret courts. Forced into a contact centre to see his boys as part of a “cooling off” period – imposed by a judge after his wife had prevented him going to his house to remove his belongings – Matt was left fighting depression after losing everything. This was followed by the death of his business partner and subsequent collapse of the parent group of companies. In an interview with John Peel on Radio 4’s Home Truths, Matt later described his life at the time as “like ground zero”. He began to drink heavily and became suicidal, unable to cope with events as his life spiraled out of control. In 2001, after what he described as an “epiphany” on Waterloo Bridge, Matt decided that instead of jumping off bridges, dads could aspire to start climbing them, and the idea of Fathers4Justice was born. He quickly set up designing a new identity for the campaign, including the infamous ‘purple hand’ logo. Refusing to take any further part in court proceedings in protest at being treated like a criminal, Matt told a judge in the Royal Courts of Justice that the treatment of fathers in the family courts was a violation of their right to family life and that he no longer recognised their authority. Turning his back on the court, as Matt walked out, a court welfare officer pleaded with him not to walk away. Two weeks later he was reunited with his children after the courts and his wife backed down, and a consent order was agreed allowing Matt to re-establish a normal relationship with his boys. Despite the resolution of his own case, Matt founded Fathers4Justice, a campaign born out of his love for his children, and his fear that one day they might suffer the same injustice as him – what he called a “living bereavement” – when they became fathers. 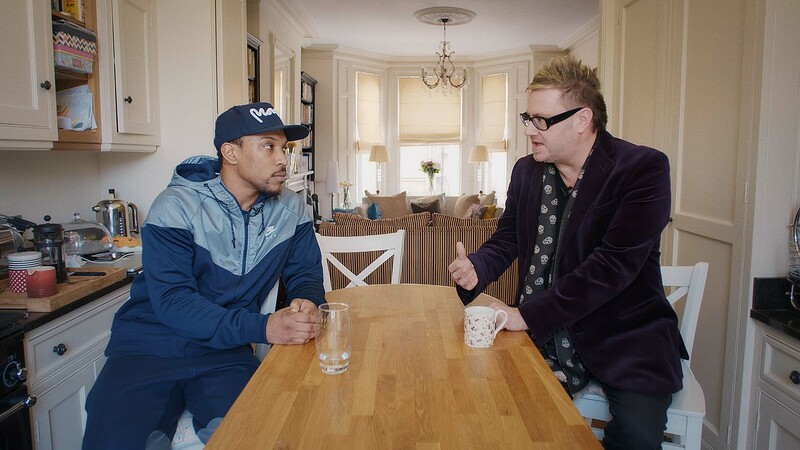 Helped by another dad, Tony Lewis, Matt set about raising awareness of the crisis in Britain’s family justice system and the cancer of family breakdown and mass fatherlessness. His first interview about the campaign was published in the Evening Standard in 2002. 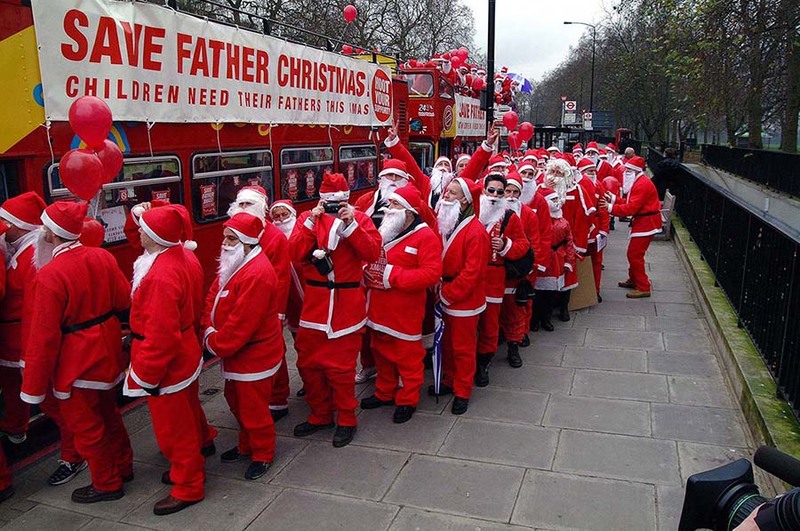 On 17th December 2002, Fathers4Justice staged their first direct action demonstration when 200 Father Christmases stormed the lobby of the Lord Chancellor’s Department. 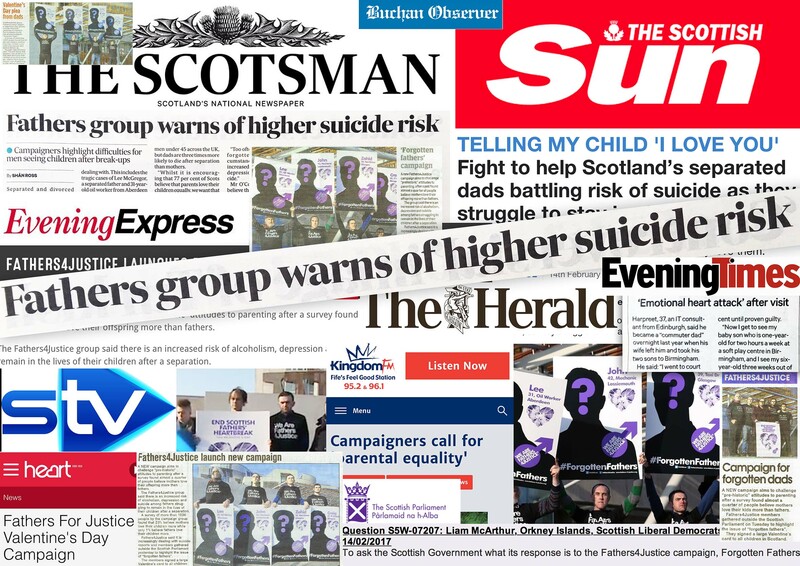 In 2003, protests quickly attracted media attention, with the first national press articles appearing in The Observer newspaper in April 2003 and The Scotsman in May. Protests included the painting of a Cafcass door in Ipswich and an occupation of the main family court in London, the Principle Registry of the Family Division, on Father’s Day 2003. This was followed by a protest on the roof of the Royal Courts of Justice. In October 2003 Matt O’Connor met William Hague and Theresa May at the Conservative Party Conference in Blackpool where they discussed shared parenting. O’Connor and May would later have a heated dispute after a television interview during which he claimed she had undergone a ‘Damascene’ conversion and now supported shared parenting after earlier refusing to back it. In October, after meetings between Fathers4Justice, Bob Geldof and government minister Lord Filkin failed to make any progress, the group responded by staging a protest on a crane over Tower Bridge involving a dad dressed as Spiderman. Traffic chaos ensued after the bridge was closed by Police at a cost of £5 million to the taxpayer. It was later revealed during the trial of protestor Dave Chick, that the road closures were a deliberate tactic by Police to try and force the protestor down. The “superheroes” campaign generated international publicity, turning Fathers4Justice into one of the highest profile campaign groups in the world and spawning a host of imitation (but unrelated) groups in different countries. The groups iconic protests garnered worldwide publicity for a cause shrouded in secrecy by the courts and ignored by the political and religious elite. Protests began in 2004 with a superhero demonstration on the Clifton Suspension Bridge in Bristol and co-ordinated protests on major arterial roads around London. This was followed by the flour-bombing of the Prime Minister in the chamber of the House of Commons in May 2004 by F4J campaigner Guy Harrison and a “Day of The Dad” protest in central London on Father’s Day. In July, protestors dressed as priests stormed York Minster during a service in front of the Archbishop of Canterbury and the General Synod. In September, Batman protestor Jason Hatch staged one of the groups biggest protests on the royal balcony at Buckingham Palace. By now, the campaign for truth, justice and equality in family law had captured the public imagination, catapulting the issues surrounding family law to the top of the political agenda, and inspiring thousands of disenfranchised parents and grandparents alike to campaign for equal parenting rights. A behind-the-scenes documentary, “Fathers4Justice: The Men That Stormed The Palace”, was subsequently broadcast on Channel 4 alongside a documentary about separated fathers made by Bob Geldof. Matt and the campaign also featured in two BBC Programmes, a BBC Newsnight Special and the People Power Documentary. He was later interviewed by Piers Morgan and Amanda Platell on their Saturday night show on Channel 4 after Home Secretary David Blunkett was denied access to his son. 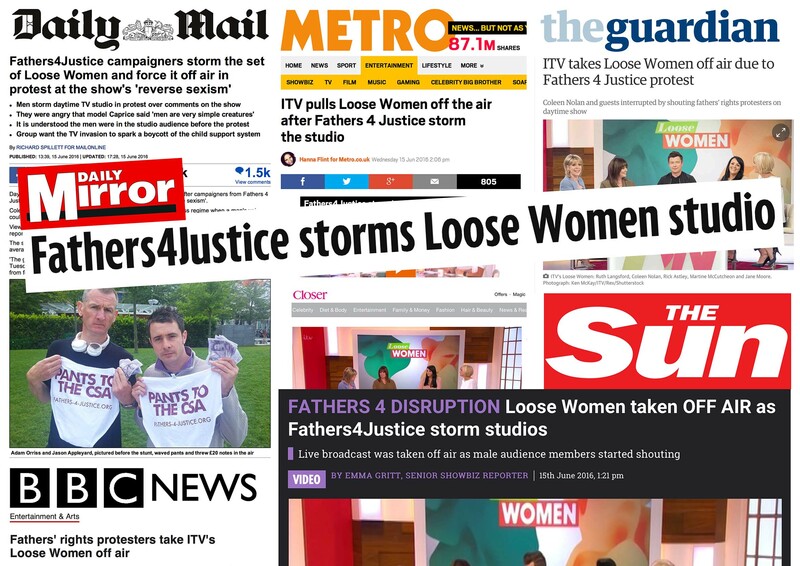 Given the attention the campaign received and the groups defiance of the judiciary and government, it was unsurprising that Fathers4Justice quickly became embroiled in controversy. Matt became the subject of press and police intrusion following the protests. He was put under police surveillance as infiltrators subverted the group, causing conflict and disagreement between supporters. 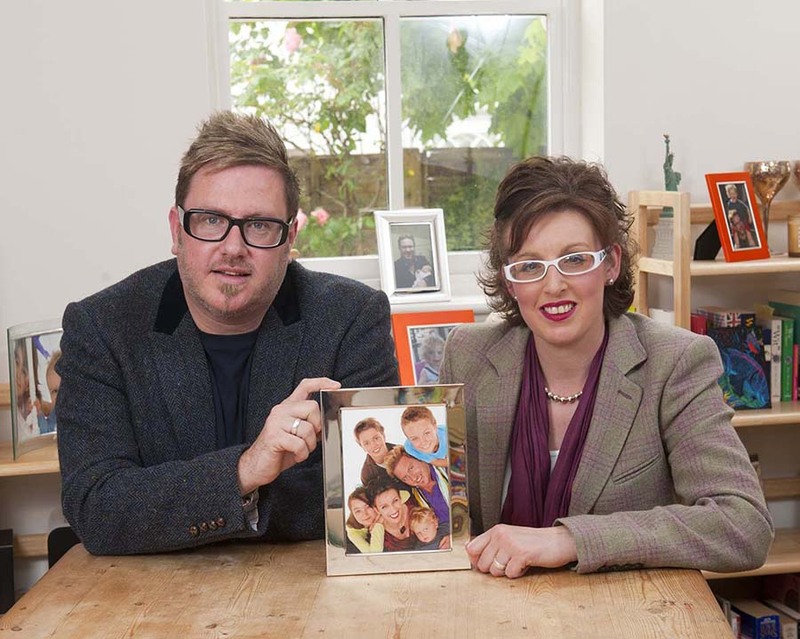 In February 2005, Matt met his future wife Nadine at a Fathers4Justice meeting. Despite the Daily Mail claiming the couple had “enough baggage to ground a 747”, Matt and Nadine went on to marry and have a son called Archie. Matt later credited Nadine with saving his life. Later that year, he sold the motion picture rights to his life story to the Disney-owned Miramax Pictures. 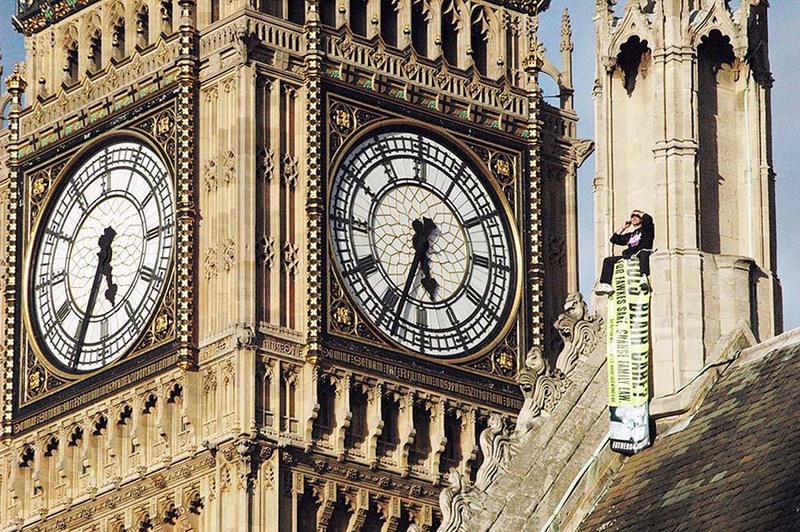 In September 2005, F4J campaigner Guy Harrison scaled the Houses of Parliament on his daughter’s birthday in protest at the continuing lack of action by the government, just over a year after he had powder-bombed the Prime Minister. In 2006 the first of a series of smears aimed at discrediting Fathers4Justice began. The Sun newspaper ran a front-page story claiming that men “on the lunatic fringe of the Fathers4Justice group” were plotting to kidnap five-year-old Leo Blair, son of then Prime Minister, Leo Blair. In an increasingly murky world where the authorities were subverting the organisation, Matt temporarily disbanded the campaign, and in doing so, secured even more front-page coverage for F4J. But the suspension of the campaign was a tactical retreat, giving F4J breathing space away from the glare of publicity. The group relaunched in May 2006 with a protest on the BBC’s National Lottery show in front of 10 million viewers, led by Nadine O’Connor. In November 20006, before the State Opening of Parliament, Matt and other activists received a letter from Scotland Yard claiming that their “personal safety could not be guaranteed” if they entered London on that day. In a conversation with an officer from Counter Terrorism Command, it was made clear to Matt that “lethal force” would be used in the event anyone attempted to breach police cordons. The threat led to Matt and Nadine O’Connor meeting Commander Bob Broadhurst at Scotland Yard to remonstrate with police about the heavy-handed intimidation of peaceful protestors. In 2007 Matt published his first book “Fathers 4 Justice: The Inside Story” through the Orion Publishing Group. Matt also appeared on ITV’s This Morning to talk about the book. In February 2007, protestors scaled Stonehenge in protest about comments made by Tory leader David Cameron. In June, F4J legal advisor Michael Cox was jailed for 42 days for refusing to pay child maintenance, arguing that as he looked after his children half the time, he already supported his kids. F4J organised protests supporting Michael outside Horfield Prison in Bristol and an interview with his sons in the Sunday Telegraph. In July, Matt was a guest speaker at the Men & Boys Crisis Conference in Washington DC, alongside author and activist, Warren Farrell and Dr Stephen Baskerville. This was followed by a protest on the Lincoln Memorial in Washington DC. In early 2008, Matt O’Connor briefly tested the political waters when he stood as a candidate in the London Mayoral Election. This was followed by one of F4J’s last direct action protests, when superheroes Jolly Stanesby and Mark Harris scaled the roof of Harriet Harman’s home in South London before Father’s Day. The protest came after the deputy Labour leader had vehemently opposed shared parenting for dads and attacked the group. The following day, Matt wrote a comment piece for The Sun Newspaper. Shortly after, F4J committed to pursuing a political campaign. Counter Terrorism Command subsequently insisted on interviewing Matt in Romsey, Hampshire, to interrogate him about his future plans. The harassment of Matt continued in 2009 when the Lord Chancellor and Secretary of State for Justice, Jack Straw MP, obtained an ex-parte injunction against Matt in the High Court, claiming he was going to publish the names and address of 237 judges in the UK. Every judge was warned of the alleged risk, as were various government departments, compromising Matt’s ability to secure a fair hearing in any future legal action as well as causing serious harm to his reputation. At a court hearing on 19th July 2009, O’Connor proved he had been out of the country at the time the email had been sent and that the Ministry of Justice had failed to perform any basic due diligence. It was quickly proved that the message-id and name of the person who sent it belonged to somebody else. The case was immediately dropped, but no action taken against the person who sent the email. In a subsequent meeting at Scotland Yard, Met Police officers said they viewed Fathers4Justice as the “greatest risk to national security in the country” at that time. They also confirmed for the first time, the existence of a recruitment programme that enlisted “stakeholders” and “information resources” to gather intelligence about O’Connor and F4J. These were often paid informants, arrested on protests, and then “turned” to provide information in return for financial inducements. The group pursued political dialogue in early 2010, meeting both Nick Clegg and David Cameron. 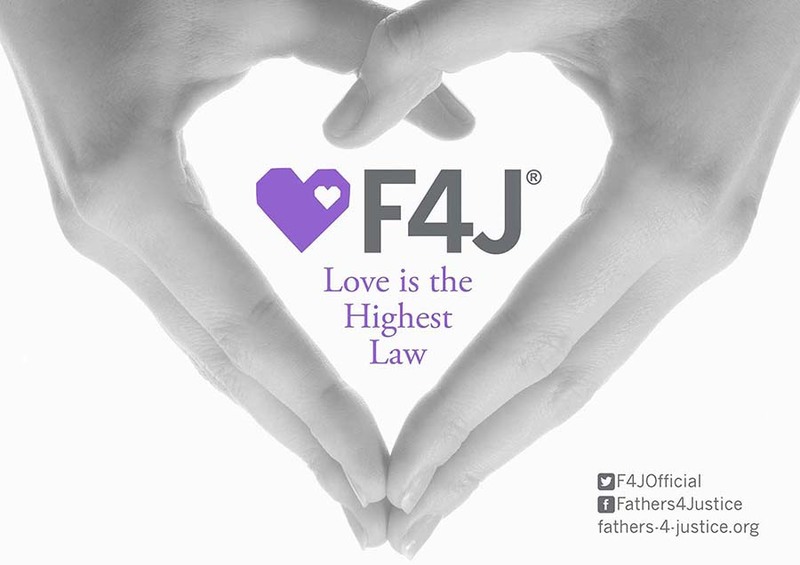 F4J subsequently entered good-faith negotiations with the Conservative Party who made an election promise to Fathers4Justice to introduce ‘a legal presumption in favour of automatic shared-contact’, set out in a 10-point-plan for Family Law Reform before the general election. However, after the election, the Conservative led government immediately abandoned the promised reforms and instead continued with the discredited Family Justice Review, headed by David Norgrove, which the Labour Party had initiated. The review effectively concluded, “fathers have no rights and should have no rights”, and ignored shocking new evidence of child abuse in the family justice system provided by F4J. 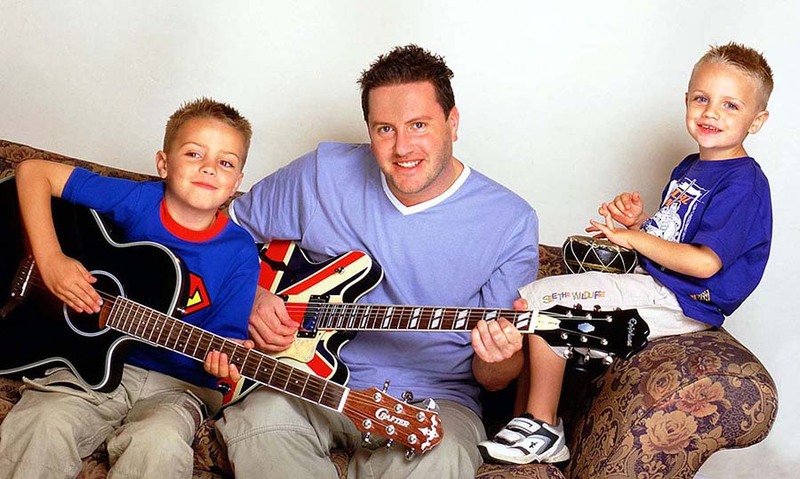 In July 2010, Matt appeared in the BBC’s Century of Fatherhood programme. In June 2011, Prime Minister David Cameron launched an unprecedented attack on fathers, saying absent fathers should be “stigmatised” by society in the same way as drink-drivers. Just days later, on the 10th anniversary of his forming Fathers 4 Justice, Matt staged an eight-day hunger strike outside the Prime Minister’s home. 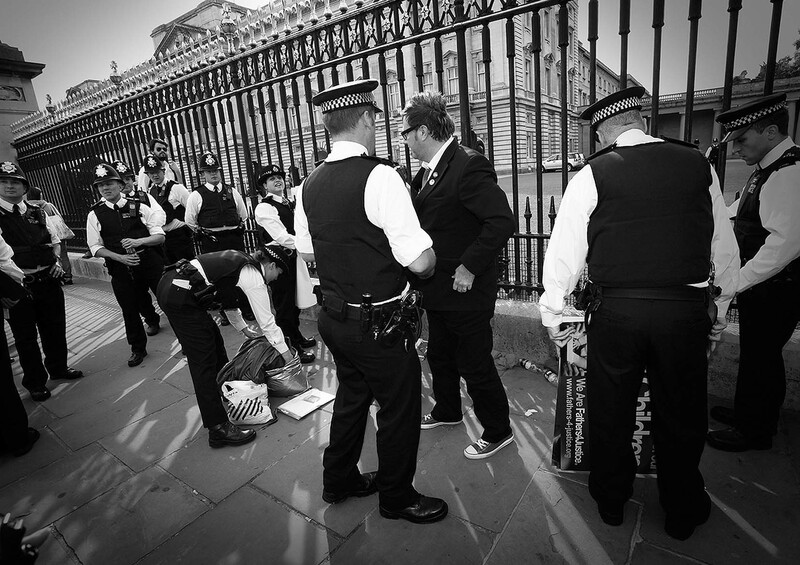 In September 2011, F4J staged their second protest at Buckingham Palace, where Matt and several others handcuffed themselves to the railings in protest at Cameron’s comments and the Conservative Party’s broken election promises. On Father’s Day 2012, F4J staged a barefoot protest, walking from Trafalgar Square to Downing Street. The group labeled the London 2012 Olympic Games, the “Fatherless Games”. In July 2012 the ASA banned a national newspaper advert by F4J which accused Mumsnet of publishing ‘anti-male hatred’ on their website. In May 2012, Matt was again banned from entering London during the State Opening of Parliament. The government and Crown Prosecution Service subsequently failed in what Matt described as an attempt to impose ‘Chinese-style’ restrictions banning him from going within 100 metres of any venue at the London 2012 Olympic Games and the Olympic Torch Relay route. 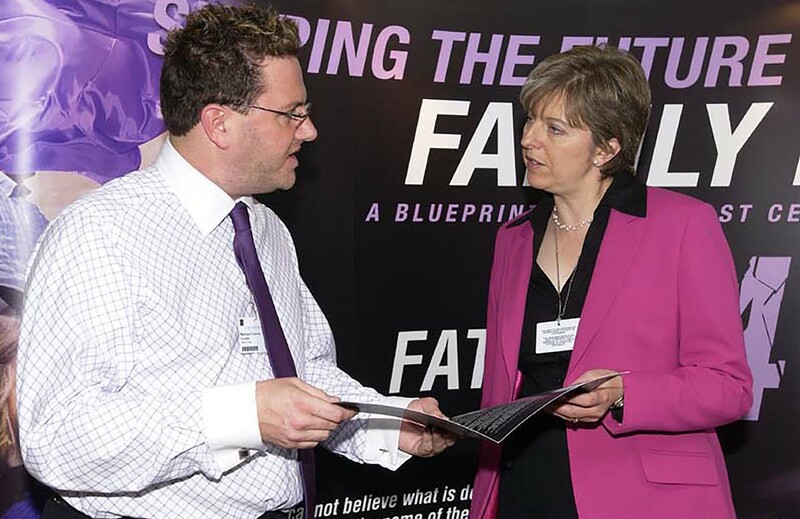 In March 2013, Conservative MP Caroline Nokes, who had also made a promise to Fathers4Justice to support shared parenting as part of her election campaign in 2010, broke her election pledge, citing support for the new Children & Families Bill. The Bill did not contain a single one of her election promises to Fathers4Justice including, critically, the commitment to shared parenting. Despite submitting a 1,000 page submission to Ms Nokes, who sat as an MP on the Children and Families Bill Committee, Nokes refused to uphold her election promise and subsequently refused to work with F4J, her constituents and local Conservative Party Members who supported shared parenting. F4J was also denied the opportunity to provide first-hand testimony to the committee, thereby denying the 36,000 families it represented a voice in Parliament. Nokes then used her political influence to launch an attack on the group’s civil liberties and democratic right to free speech. She used political lobbyists to take down the Fathers4Justice Twitter feed and then attempted to take down the Fathers4Justice Facebook page citing ‘harassment’ by the groups supporters. Both accounts were later restored. Nokes then began making a series of false allegations about the campaign, in an attempt to distract attention away from her broken promises and discredit Fathers4Justice. In April 2013, the BBC broadcast an apology to Fathers4Justice by the former President of the Family Division, Dame Elizabeth Butler-Sloss, who had wrongly claimed the group had made death threats against her, in yet another smear of the organisation. The stream of false allegations were no longer isolated incidents, but appeared to form part of sustained attempt by establishment figures and the media to discredit F4J. 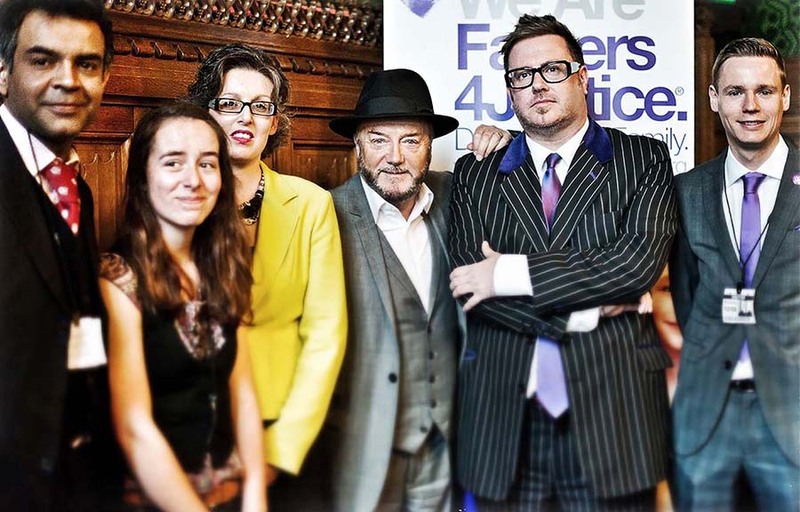 Despite this, on the 12th June 2013, just before Father’s Day, Matt & Nadine O’Connor and Fathers4Justice were invited to speak in the House of Commons for the first time, at the Shared Parenting Debate chaired by George Galloway MP. Galloway then sponsored Early Day Motion 210, supporting shared parenting and Fathers4Justice. 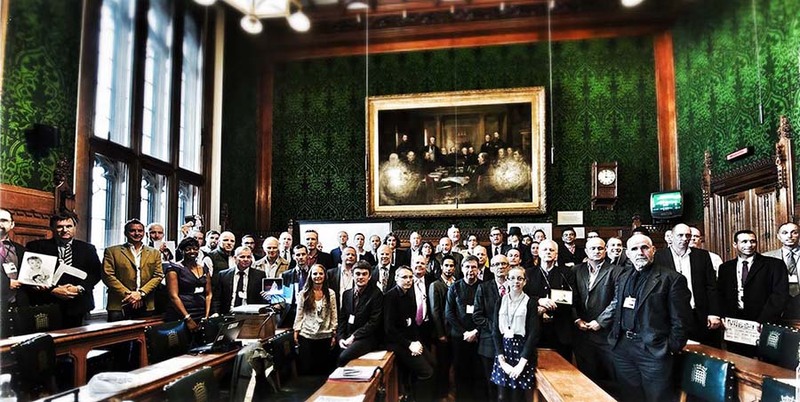 Significantly, EDM 210 was signed by 104 MPs from all political parties, including John Redwood (Conservative), Andrew Brigden (Conservative), Julian Lewis (Conservative), David Blunkett (Labour), Frank Field (Labour), Gerald Kaufman (Labour), David Lammy (Labour) & Caroline Lucas (Green). Despite the political progress, there followed a spate of protests at art galleries in London by frustrated dads, one of whom, Tim Harris, had sprayed ‘help’ on a portrait of the Queen in Westminster Abbey. In December 2013, actress Kate Winslet threatened to sue Fathers4Justice over an ad campaign it was planning, which criticised comments made by the star in Vogue magazine attacking Shared Parenting. On 28th December 2013, Matt and Nadine O’Connor were interviewed by George Galloway MP on his Sputnik programme on Russia Today. On 20th February 2014, there was a serious, violent attack at Matt’s family home in Hampshire where Matt was assaulted and his landlord savagely bitten. The incident marked the beginning of an 18-month-long campaign of intimidation targeting his children and home, which included the sending of hate mail about his children, the family car being smashed up, death threats and the targeting of the family on social media. Fearing for the safety of their children, and in the absence of any police protection, the family moved home. 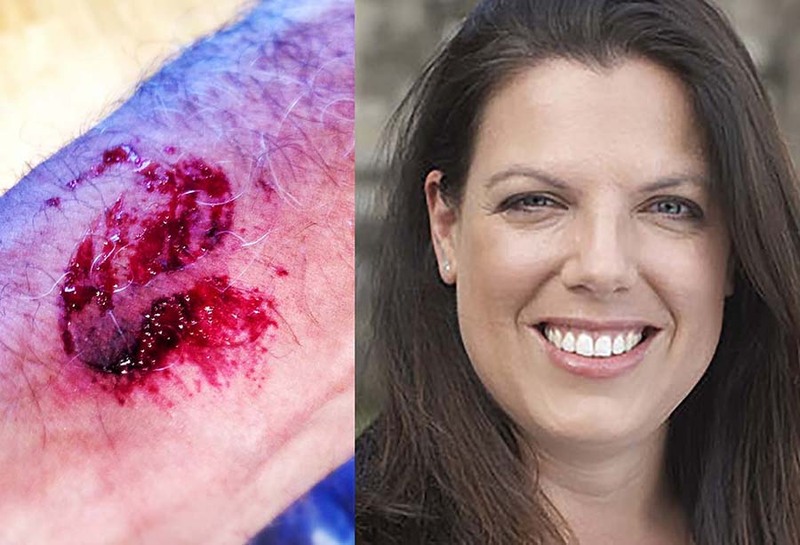 Despite repeated denials, and a concerted cover-up by Hampshire Police, it transpired Caroline Nokes MP had driven to London to collect a friend and bring him to O’Connor’s home, before waiting for him while the attack took place. Not only had Nokes categorically denied being present, but she had claimed Parliamentary expenses for the trip. Remarkably, no one was charged over the incident, despite graphic photographic and video evidence published in the media. In the absence of any criminal prosecution, the O’Connor family began a civil case against the MP for aiding and abetting, and the continued harassment of their family by Nokes and her associates. When the case came to court, the MP responded by launching a concerted pre-election smear campaign against the O’Connor’s and F4J in the national media, claiming the group had harassed her. 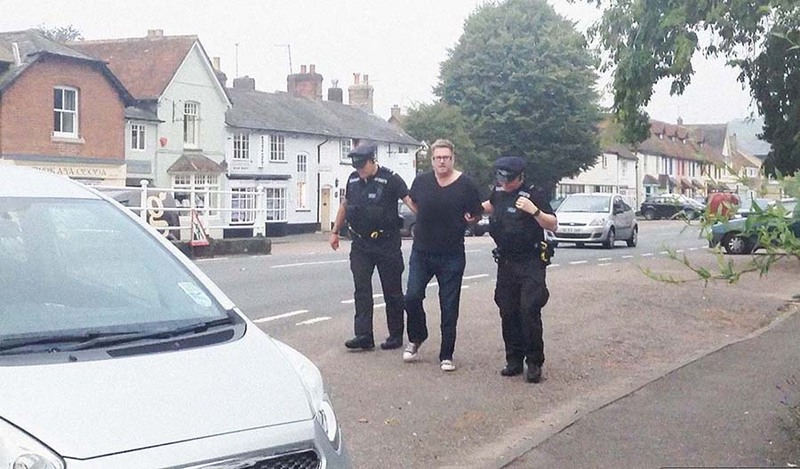 In September 2014, following complaints to Hampshire Police about their conduct and failure to protect his family, Matt was arrested outside his home by Hampshire Police for a Section 5 Public Order Act Offence. In contrast to the cover up surrounding Ms Nokes, Matt’s arrest was widely publicised by Hampshire Police. O’Connor said his arrest was politically motivated, unlawful and linked directly to his complaints about the force. Over the course of the next year-and-a-half, there followed five court hearings, one judge recused himself and one Crown Prosecutor stood down after he was overheard coaching a prosecution witness. The trial was adjourned in February 2015 after Aldershot Magistrates Court arbitrarily denied entry to the public, trial witnesses and a county councilor in an attempt to hear the case in secret. In October 2015, Matt was given leave to seek Judicial Review of the decision in the Royal Courts of Justice, aided by open justice campaigner Dr Michael Pelling. In December 2015, Her Majesty’s Courts & Tribunals Service appointed Government solicitors to represent them in court. The hearing is expected to take place in 2016. In early 2015, Matt wrote two comment pieces in the Sunday Express. One followed the publication of alarming figures about the death rates of non-resident fathers after separation, the other called for the creation of a Minister For Men to address the public health crisis facing men and boys. 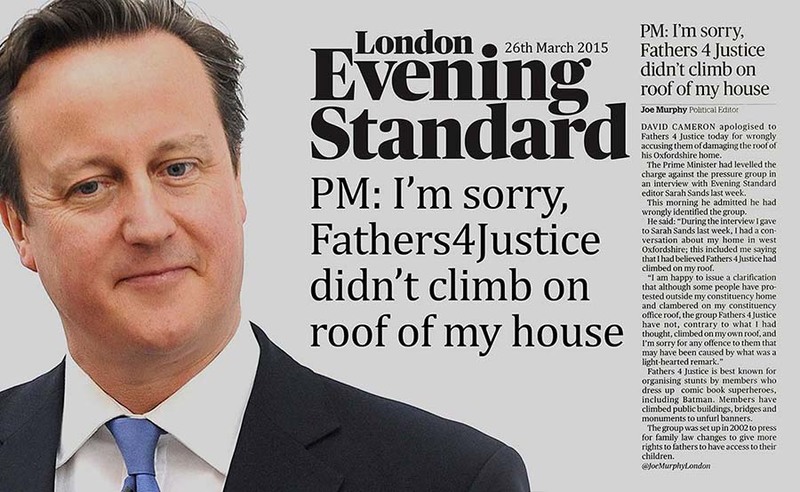 In March 2015, in the run up to the 2015 General Election, Fathers4Justice was subject to further Tory smears, this time by the Prime Minister, David Cameron, who claimed in the Evening Standard and Telegraph that F4J had climbed on the roof of his home. 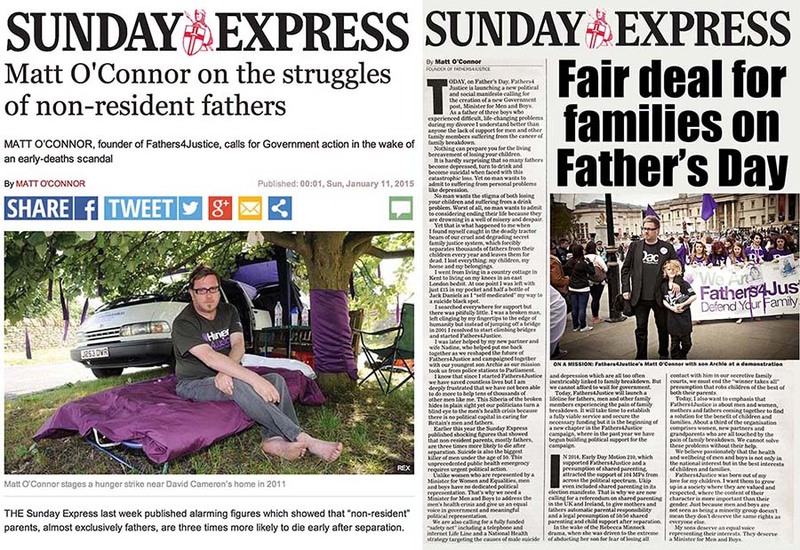 After sending him a letter before action for libel, Cameron apologised to Matt O’Connor and Fathers4Justice. UKIP Deputy Chair Suzanne Evans later spoke to Matt O’Connor about the commitment. George Galloway also backed the campaign for shared parenting, interviewing Matt on his Sputnik programme for a second time before speaking to F4J on camera in more detail about the issue. 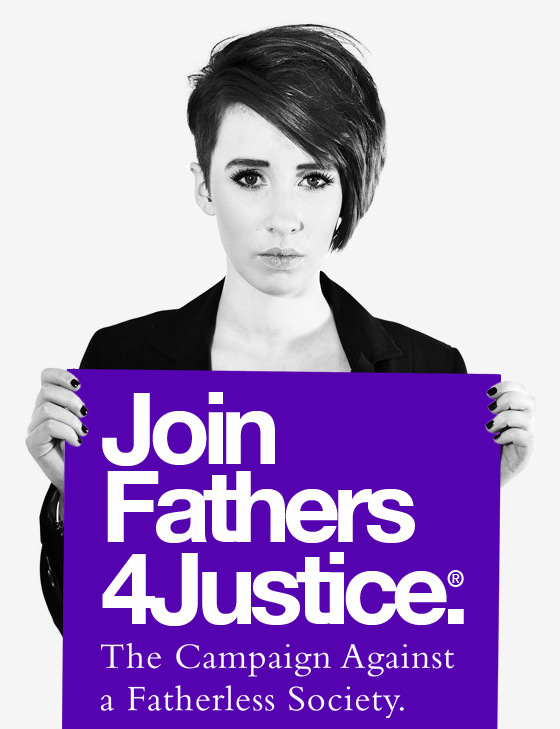 On Father’s Day 2015, Fathers4Justice launched their Manifesto for Men and Boys calling for Shared Parenting and the appointment of a Minister for Men. Matt also gave his first interview to the Guardian newspaper in which he set out a new path for the campaign, though he later complained that the article was not only written with “tangible disdain”, but was misleading and falsely attributed quotes to him. That same week, he was also interviewed on the Lorraine show on ITV1. In the Telegraph newspaper in August, Matt called for an end to institutional gender discrimination against dads. 2016: Divided by law, united by love. Our struggle continues. 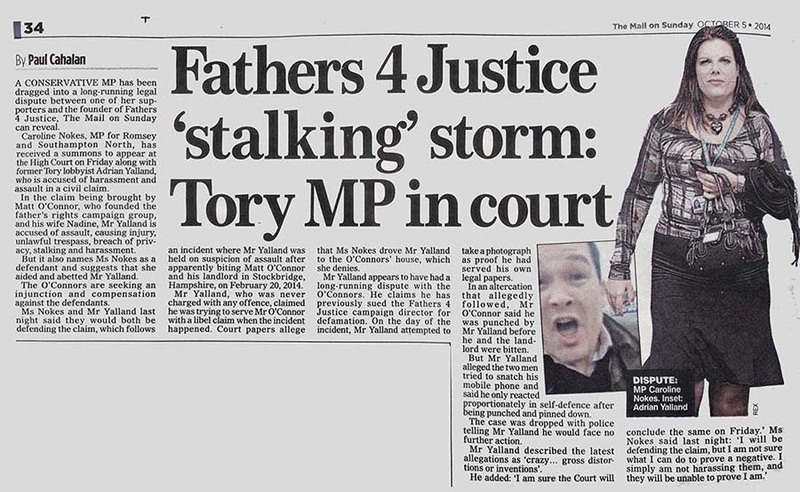 In January 2016, another Tory MP made false allegations against Fathers4Justice. The former Parliamentary Under Secretary of State for Children and Families, Tim Loughton, claimed in an article he wrote for the Guardian, that when he was a Minister the group threatened to target his family home. This was the latest in a series of smears involving Tory politicians. The group wrote to Mr Loughton asking him to withdraw the remark and apologise. In March 2016, the London Borough of Barnet threatened F4J with legal action on behalf of McDonalds over their “McDads” campaign. 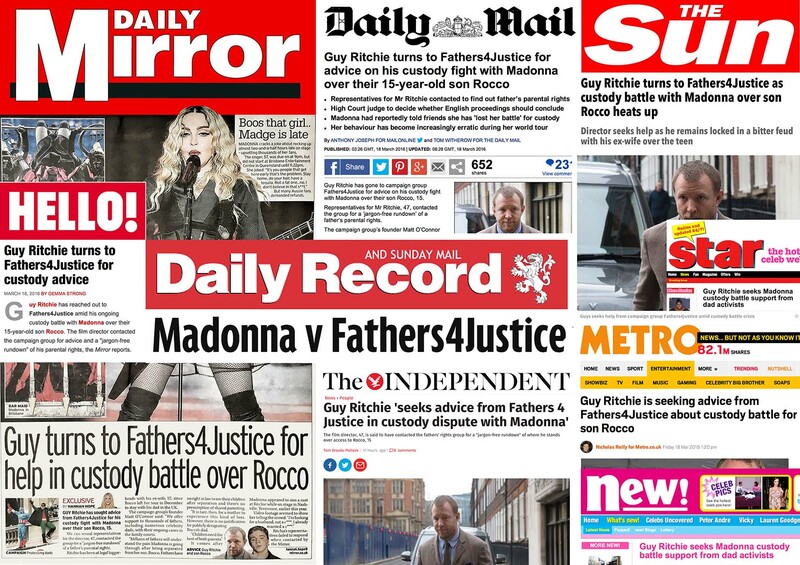 A week later the tabloids reported that Guy Ritchie had asked Fathers4Justice to help in his custody battle with Madonna over his son Rocco. Matt was interviewed about the dispute by John Gaunt on Talk2Me Radio. The following month, footballer Jamie O’Hara also contacted F4J for advice in his access battle with Danielle Lloyd. 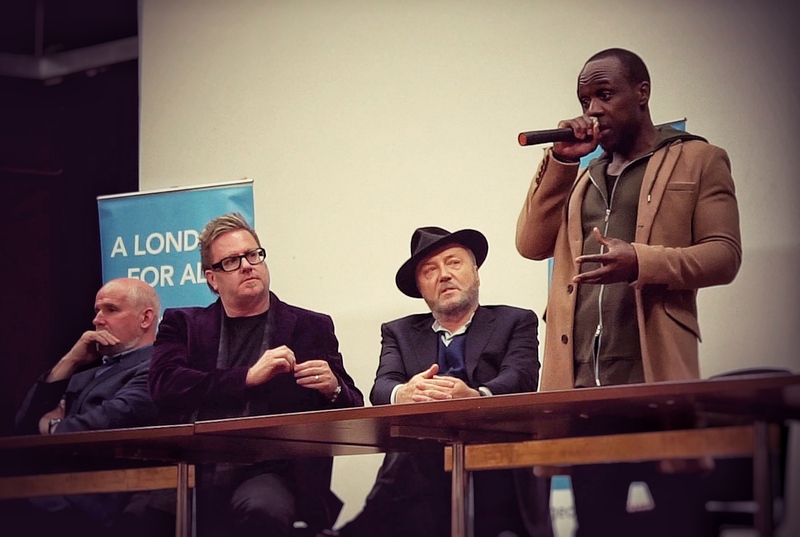 On April 27th, George Galloway, Matt O’Connor, Irish writer John Waters and ex-EastEnders star Mo George joined a platform of speakers at a public meeting, “London: The Fatherless Capital”, to debate the issues of fathers and fatherlessness. John Waters followed up the meeting with an article in Ireland’s leading political magazine, The Village. In May, Stand By Your Manhood author Peter Lloyd and Matt O’Connor hit back in the Daily Mail at claims that 50/50 shared parenting was ‘agony’ for mothers. 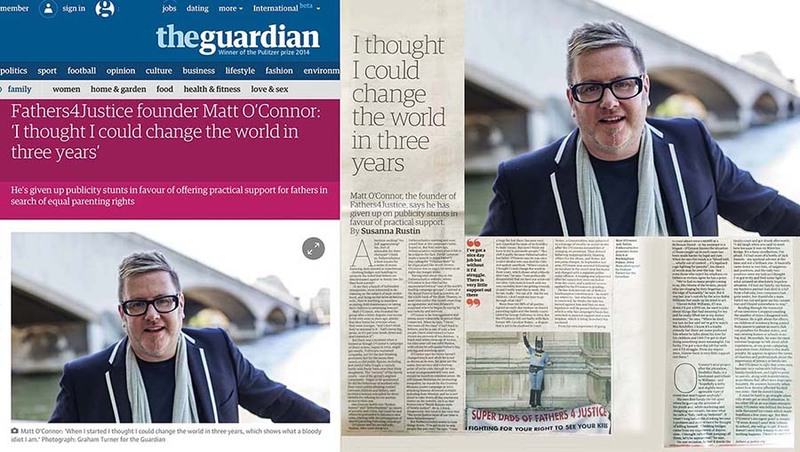 Later that month, The Telegraph marked the 10th anniversary of the Fathers4Justice protest on the BBC’s National Lottery show with an interview with Matt and Nadine O’Connor about the protest. In June 2016, the group launched the campaign in Ireland and announced the start of a Child Support Strike when they stormed the Loose Women studio, forcing the show off air. 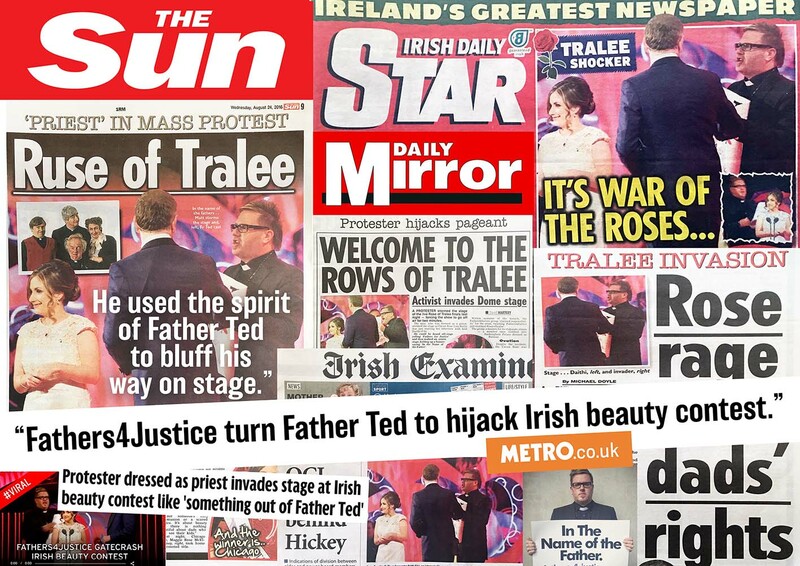 In August, F4J hit the front pages in Ireland when Matt O’Connor turned Father Ted to hijack Irish beauty contest the Rose of Tralee. In November, the High Court ruled that Aldershot Magistrates Court acted unlawfully in excluding the public from attending the trial of Matt O’Connor, for a Section 5 Public Order Act offence. 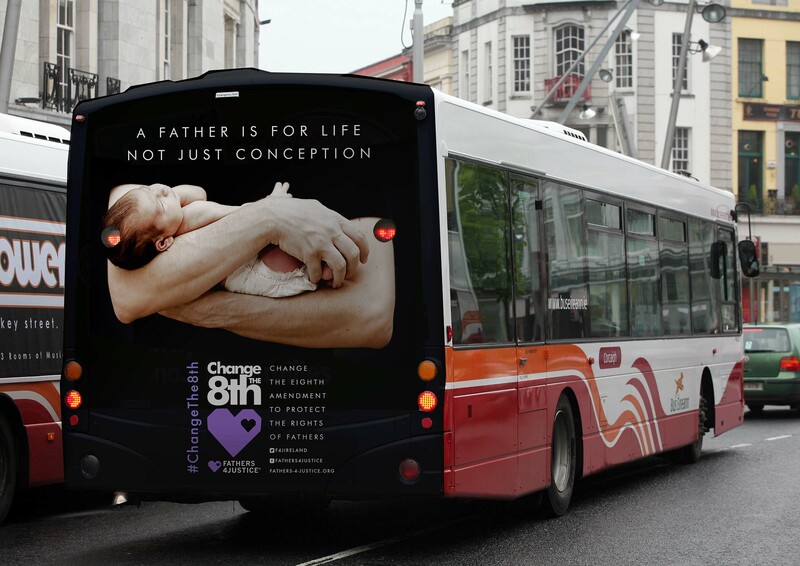 Later that month, F4J launched their ‘Change The 8th’ campaign on buses in Cork, Ireland. The ad featured a picture of a man cradling a new born child with the words ‘a father is for life not just conception’. Cork Pro Choice group later apologised to F4J and paid damages for libel after claiming the campaign ‘promoted’ domestic violence. 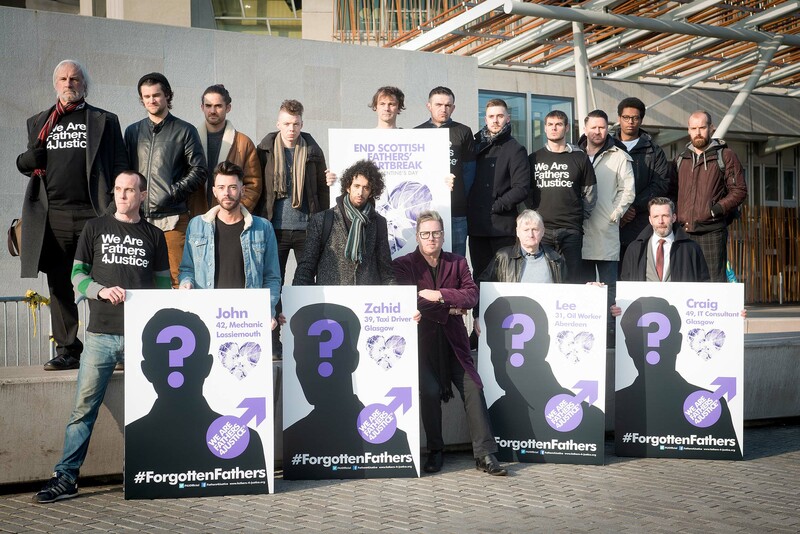 On Valentine’s Day 2017, F4J launched their ‘Forgotten Fathers’ campaign outside the Scottish Parliament. The event attracted widespread media coverage in the Scottish press. Research published by F4J found that 23% of Scots believe that mothers love their children more than fathers. The Scottish Government subsequently responded to the campaign. 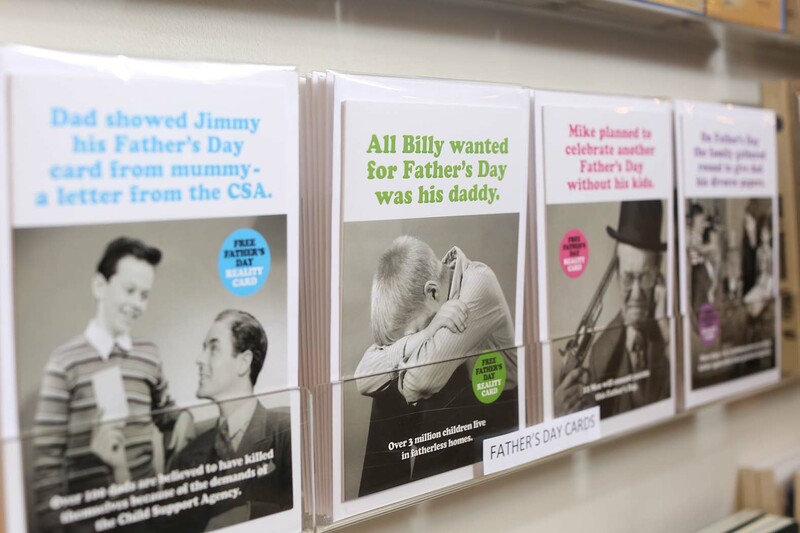 On Father’s Day 2017, F4J launched a range of “Father’s Day Reality Cards”, covertly inserted onto the shelves of card retailers in a guerilla campaign to expose the reality facing separated dads at this time of year. The cards were supported by media coverage in the UK and Ireland. 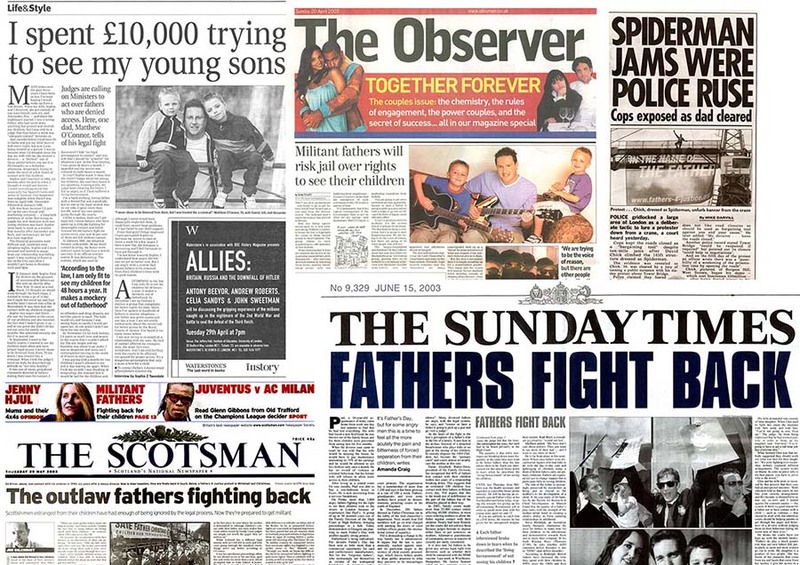 Today, 15 years after it was founded, Fathers4Justice is the world’s largest equal parenting campaign group with over 80,000 registered families in the UK and Ireland. The campaign has persuaded politicians from across the political spectrum to accept that shared parenting is responsible parenting, and will lead to better outcomes for our children, our families and our country. But the struggle for equality continues. Whilst grassroots politicians support the campaign, the political elite refuse to tackle the cancer of fatherlessness and family breakdown. Broken promises by the Conservative Party, their targeting of Fathers4Justice, and their ability to evade justice and accountability, raises serious questions about the relationship between our politicians, the police and the establishment media. 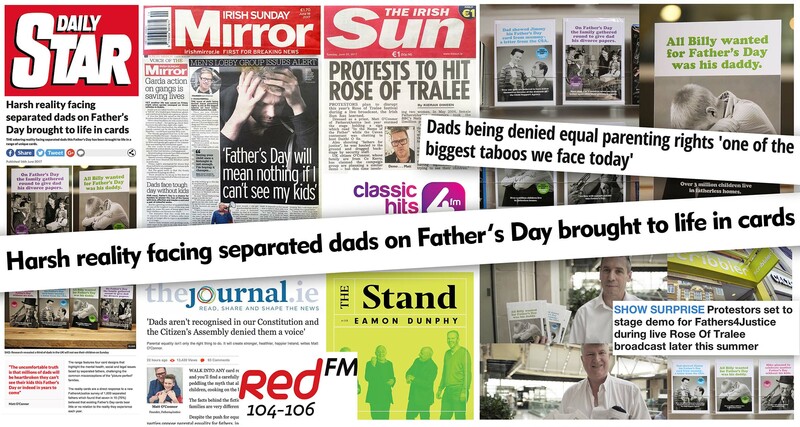 Today, Matt O’Connor and Fathers4Justice remain defiant, committed to ensuring that automatic parental responsibility for dads, and a legal presumption of 50/50 shared parenting and child support, becomes law by the end of the decade. 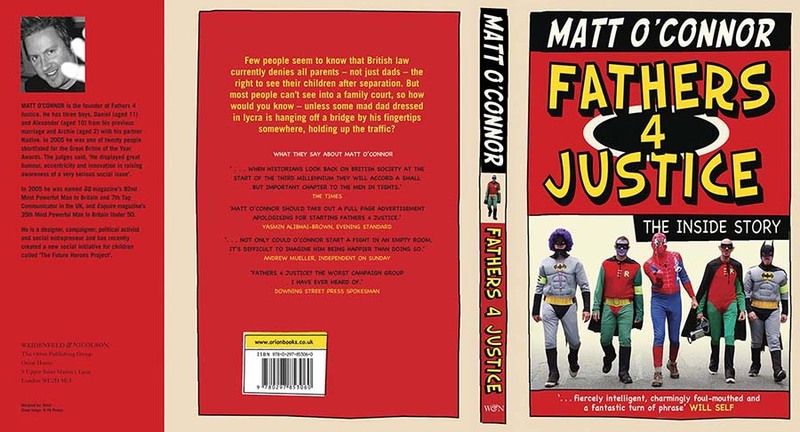 A second book about the Fathers4Justice campaign will be published in 2017.